Empire Oyster is, without a doubt, the talk of the town. For the uninformed, I’m referring to the raw oyster bar that opened up at the beginning of March inside the EDGE District’s Intermezzo Coffee and Cocktails. Coffee, cocktails and oysters. It seems like an unlikely trio does it not? Certainly I would’ve never predicted it, but the combination has proven to be a smashing success at 1111 Central Ave.
Intermezzo Coffee originally opened as a pop-up coffee bar in September of last year — planning to only be open for 3 months. However after much success, owner Jarrett Sabatini resolved to keep Intermezzo Coffee open permanently. In January, Sabatini decided that instead of closing the coffee shop in the afternoon, he would simply transition the space into a cocktail lounge at 5pm every day. Sabatini developed a fantastic drink menu that offers his own innovative creations as well as tried and true classics. Again, he found success. Three months later, a new decal went up in the window — “EMPIRE OYSTER”. It was then that St. Petersburg was introduced to an incredible raw oyster experience courtesy of Kevin Joseph, Master Mermmelier at Empire Oyster. Although if you ask me, the best part about Empire Oyster is not their world-class oysters. It’s not their succulent lobster rolls or peel-and-eat shrimp either. It’s the work that Kevin Joseph does to help protect and restore oyster beds in Tampa Bay. Kevin has teamed up with Tampa Bay Watch, a local nonprofit that is working to preserve the delicate ecological balance that exists in Tampa Bay. Each week, Kevin and his team shuck over 2,000 oysters. Instead of pitching the empty shells in the trash destined to rot in a landfill, the shells are saved in black bins and donated to help construct new oyster communities. With the donated oyster shells, Tampa Bay Watch will create two types of habitats for oysters in the area — oyster domes and oyster shell bars. The oyster domes (pictures to the right) are primarily used in manmade areas such as dredged canals and seawalls. The domes attract oyster larvae, and eventually become covered with mature oysters. The second type of oyster habitat, the oyster shell bars, are meant to mimic a natural oyster bar and are primarily installed along natural shorelines. The goal of restoring oyster habitats in Tampa Bay is two-fold. First, the oyster-covered domes and bars offer water quality benefits, food for birds and wildlife, and are an effective means of wave attenuation. The second goal is to provide environmental education and stewardship to local middle and high school students and community volunteers through hands-on community restoration. The original plans had Kevin flying down to St. Pete from his home in New York City and running the raw bar from the beginning of March until the end of May. However, due to popular demand, Empire Oyster will remain a permanent fixture of the EDGE District. If you haven’t visited yet, you’re in for a treat. The raw bar is set up omakase style, where Kevin shucks oysters by hand and presents them to you seconds later in the half shell. And believe it or not, Kevin claims to have the best oysters in town. “Typically, I have nine varieties of oyster from all 3 coasts — east, west, and Gulf.” You would never see that kind of variety in a restaurant up north. However, in a really good restaurant down here in Florida, you might. Each variety of oyster has it’s own flavor, texture, size, and mouthfeel. The oyster lineup changes every week. Kevin curates the oyster list like an art gallery curates shows. For example, this week’s menu consists of oysters from Washington, New York, Massachusetts and Virginia. In the past, Kevin has offered oysters from Alaska, North Carolina, New Zealand, and various provinces of Canada, such as New Brunswick, Prince Edward Island and British Columbia. Each week, the oysters are overnighted via FedEx, ensuring that you are eating the freshest oysters — harvested yesterday in some cases. Even in the big cities, most of the distributors and restaurants are getting three to four day old oysters. If you’d like to spice up your oyster experience, Kevin also provides the largest selection of sauces, accoutrements and garnishes that I’ve ever seen at an oyster bar. Before each shift, Kevin whips up a variety of toppings to accompany his oysters. The wasabi cucumber cilantro mignonette with champagne vinegar goes well with the west coast oysters. 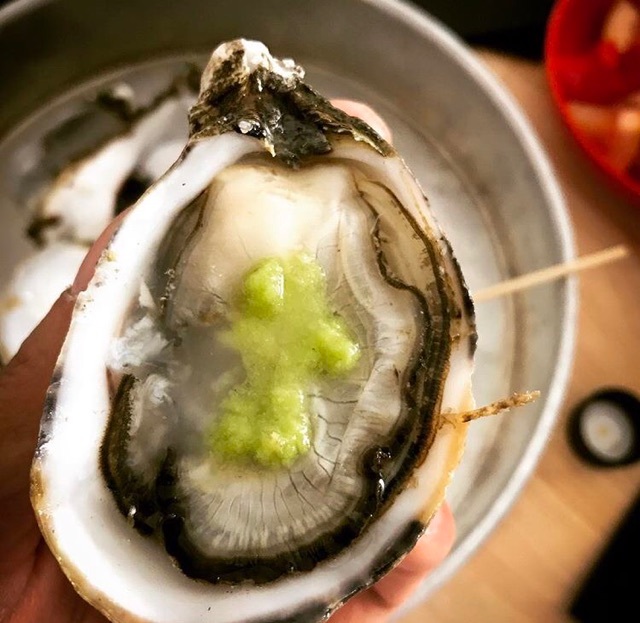 Or perhaps you’d like to try a ‘spirited oyster’, where you place a few drops of a liquor on the oyster, such as a kumamoto with tequila and lime or a kumamoto with grapefruit and vodka. The next time you visit Empire Oyster, be sure to ask Kevin to tell you more about the work he is doing to help out our aquatic environment. And while there, knock back a few of his raw oysters while enjoying a carefully crafted cocktail from one of the Intermezzo bartenders. Empire Oyster is located inside of Intermezzo Coffee and Cocktails at 1111 Central Ave in beautiful Downtown St. Pete. Their hours are Wednesday through Sunday from 6pm to 9pm. Stay up-to-date on the week’s fresh oyster offerings and special events by visiting their website and following them on Facebook and Instagram. Intermezzo Coffee and Cocktails is open Tuesday through Sunday, serving coffee from 8am to 5pm and cocktails from 5pm to close. You can follow them on Facebook and Instagram as well. On May 20th, Empire Oyster hosts the Fly Fishing Film Tour 2017, a showcase of 20 short fishing films. The event will include lessons in shucking oysters and fly casting basics. YETI, Costa Sunglasses, Skinny Water Culture, and Simms Fishing will be on hand exhibiting their products.